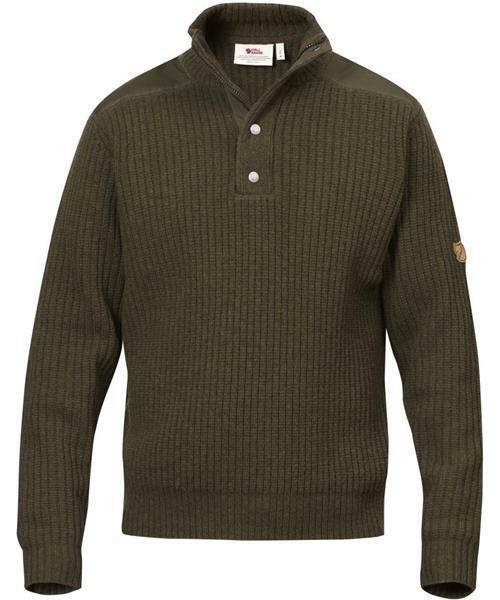 Knitted sweater in soft, warm lambswool, perfect for long days in the forest in cool weather. The robust knitting keeps its shape well over time and its lofty structure traps a lot of insulating air. Perfect as a warm mid layer, wool wicks away moisture from base-layer garments and keeps its insulating properties even when damp. Reinforcements in G-1000 Silent Eco (recycled polyester and organic cotton) over the shoulders which reduces friction when wearing a backpack. High collar with a half-length zipper and protective flap in G-1000 Silent Eco at the front. Ribbed sleeve cuffs and hem.